The lineup for the 2016 installment of one of the longest-running country music institutions has finally been released. 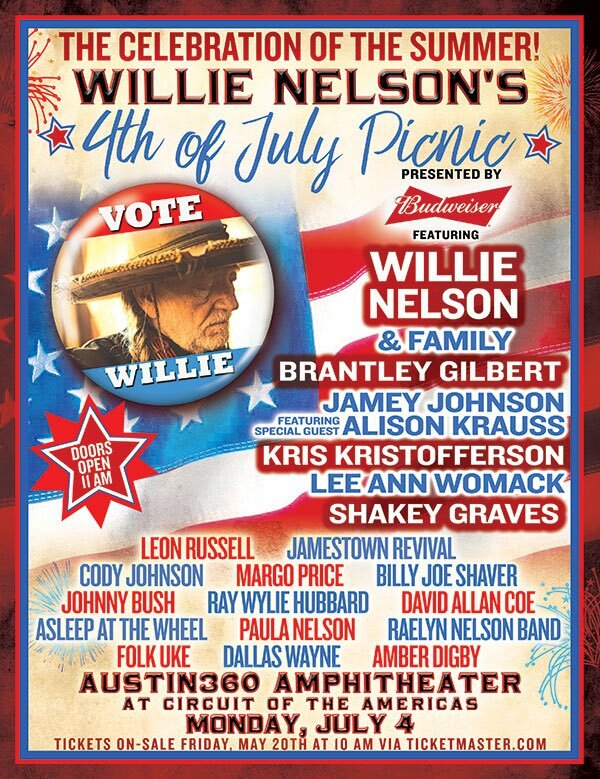 Going strong since 1972 when the tradition started with the Willie Nelson-helmed Dripping Springs Reunion just outside of Austin, the 4th of July Picnics have been a yearly mainstay for country fans in Texas and beyond. The event has also included a few mainstream wild cards over the years, and while last year featured the palatable Eric Church and Kacey Musgraves, this year Brantley Gilbert somehow muscles his way onto the top of the lineup. Aside from that, the lineup is quite strong, though nothing may top 2015’s lineup when promoters C3 Presents were able to wrangle Sturgill Simpson, Jason Isbell, and Chris Stapleton all on the same stage. Billy Bob’s Texas in Ft. Worth, where the 4th of July Picnic was held for many years, has also scaled back slightly this year, only offering one evening with four bands instead of a two-day shindig like last year. The Turnpike Troubadours are headlining the Billy Bob’s event, and it will be held on July 2nd. Presale for tickets starts May 19th. All tickets go on sale at 10 a.m. on May 20 via Ticketbastard. Tickets are $85 for reserved seats in the Amphitheater, $65 for the general admission and standing-room pit, and $39.50 and up for general-admission lawn seating. VIP packages are also available for $300-$500. For all the Brantley Gilbert haters listen to the song A Modern Day Prodigal Son on the album of the same name. It was before he made it big and it is what country music is about. That’s also back when he sang properly. I bet he sounded much better live back then. “Modern Day Prodigal Son” was released seven years ago. You think there’s any chance Brantley’s going to play that song during this set? No, he’s going to play the same set he plays opening for Jason Aldean. I’m not saying that Brantley Gilbert is the worst of the worst. He does have a few good songs. And he’s also got a boatload of terrible ones, especially his most high profile singles. Look, this is not Brantley Gilbert’s fault. He’s going to catch a bunch of flack, but he is who he is. The people to blame are the promoters. It was totally inappropriate to put Brantley Gilbert into this lineup, especially since he’s probably going to play the slot right before Willie. There is no doubt this lineup would be BETTER without Brantley Gilbert in it, and nobody else filling that slot. And again, that’s no offense to Brantley. It’s just not appropriate considering the rest of the lineup. Having said that, this event over the years has always featured one or two mainstream guys. In fact when I went to the Willie Nelson Picnic in Ft. Worth in 2011 when it was combined with the now defunct Country Throwdown tour, guess who played it? Brantley Gilbert. And he was just as inappropriate then as he is now. However this time he’s coming in as the big headliner. That’s what makes it terrible. I have it from reliable sources that the reason it took so long to announce this year’s 4th of July lineups for multiple events is because there was a dearth of available talent compared to previous years. That’s why we’re seeing scaled back lineups and strange names filling out the rosters. They were reaching for a big name, and they reached too far. And they were never going to top last year’s lineup, which was one for the ages. That lineup last year was killer. Wish I could have attended. Still dreaming I went to that Willie and Merle Pancho and Lefty performance. Had to do a double take when I saw Brantley Gilbert’s name. Which of these is not like the others? I wish the Lonesome Fugitive was still alive so he could attend (but don’t we all?). Any word on DAC’s live show since all of that hullabaloo with his son went down a few years ago? Has it improved at all, or remained more or less the same as it has been for the past few years? DAC’s sets have been hit and miss for years. The biggest issue at the moment is not any hullaballo for his son. It’s if he’ll be in Federal prison for tax evasion come set time. Something tells me Willie would understand. By the way, what happened to the “Edit” option for comments? Too much spam or something? Well, not as good as last year’s line up, but there probably never will be a lineup that great again. Still, Willie, David, Kris, and Billy Joe are going to be there, so sign me up! Lineup made for all audiences. Supposedly DAC puts on a show that’s worthy of his character (that is to say a rather terrible one). I’d actually like to see him but I have a very real fear that I’ll regret it, if not wholly want to return home and scorch my collection of his music. By the way, you’d probably disagree, but I’d throw Alan Jackson on that list of “greatest living country artists.” His integrity and commitment to his own style are very impressive. Then we have Coe who takes the stage with a wig, apparently only performs melodies of his most popular songs and segues into Toby Keith covers (not that I personally have a problem with Keith, but something about Coe covering him just seems wrong). By the way, how was the GNR show? Assuming you’ve been to it by now, of course. Hopefully all three of your wives made it. I’m surprised Lukas isn’t making an appearance. I know he had this heck of a tour with Shooter. I didn’t attend it, but it was within an hour from my house. Can’t say it’s very though, but that’s a different story. Looks like a great lineup; I wish I was closer. While not as impressive as this, the Calgary Folk Festival in mid-July (21st to 24th) has some great talent performing this year. Among many other artists that I’m not too familiar with, it features Elizabeth Cook, Sam Outlaw, Marty Stuart, Corb Lund and Ian Tyson. Also, I just discovered that Sturgill Simpson is coming to Calgary (not to mention Dolly Parton, too!). This is shaping up to be a great summer/fall in this neck of the woods. Nice lineup. Like seeing Shaky Graves in there. As for Brantley, out of the bro country guys, he’s one of the few with some decent songs. 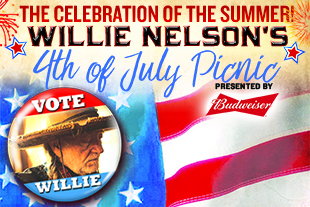 Tickets….. Where can I buy tickets for 2016, Willie 4th????? None of the links work. Has anyone actually bought tickets? Tickets are not available until May 20th. Presale on May 19th. Read last paragraph. So we went to my 1st picnic show last year… oh man it was incredible… the usual suspects… DAC, Billy Joe, RHW, Kris etc plus Merle and Willie together, something I won’t forget… and sounds like all picnics are not that good but I guess I picked a good one last year to start. Does anyone know that chronological order of the players? Had some issues taking it all in last year going back and forth between stages. I got to say for a concert of this type the venue is excellent.